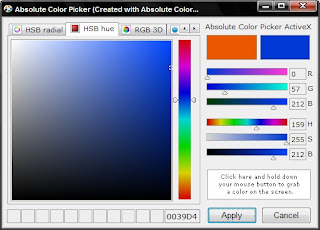 Absolute Color Picker is a free software for webmasters and web-designers. This is a simple application based on Absolute Color Picker ActiveX Control that lets you select and pick colors by means of various color models and convert them into HTML-based hexadecimal representation. Being a great compact color designer it features a free color picker, color scheme generator, color history builder, color scheme management system, screen color grabber and much more. The best feature of this software is that you can pick color from any part of the monitor screen, even outside the software window. You can pick color from an external image, some other website, the taskbar or just anywhere. A great tool when you need to match color of a certain section of your site to another section. Say, you want to have the side bar color matched with the header color or blend the Adsense unit background color with that of the site's background. Just pick the color of the background and copy the hexadecimal code to the Adsense code. This particular software has saved me a lot of time and made working with website colors a lot easier. If you don't have this already then download it now! !